In the run up to JUMP 2011, the challenge of gathering and using data across all channels remains a key issue for marketers. Last year, social and mobile were the new kids on the block and now it’s fair to say they are now serious contenders for fully established marketing channels. Although these new channels present new challenges, when it comes to data gathering and gleaning intelligence to manage a customer’s journey, they are ultimately just new channels that need to be treated in much the same way as the existing channels. Find A New Rebecca: the future of recruiting? innovative, and quite frankly brilliant, job advertisement. Now admittedly, using social media to advertise a role is hardly radical. However, the way in which it was used by both the employer (Poke), and potential employees, was a marvel to behold. Should your brand aspire to be a Rebecca Black? on YouTube, Facebook and Twitter. 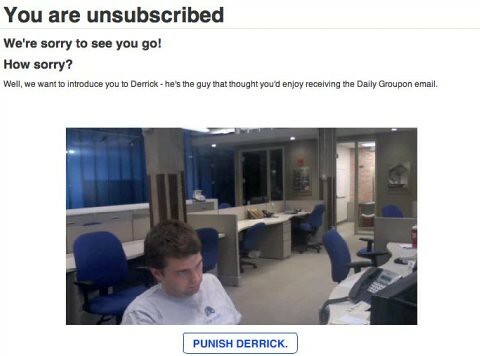 Recently marketers and consumers alike have been enjoying the creative element behind Groupon’s unsubscribe campaign ‘Punish Derrick’. If you click on the unsubscribe link, it then it leads you to a page which enables you to punish the person who has been sending you your emails, Derrick. Recent statistics have proved what we all know: the mobile consumer is rising. In 2010 smartphone purchases increased by 72.1% and a week doesn’t go by when we hear of retailers launching mobile commerce sites or mobile initiatives revealed. It seems there is consumer demand for mobile services but understanding the mobile consumer psyche is confusing. Brands are collecting lots of information about their customers, yet many brands are still sending out generic marketing, which fails to make use of this data. In the run up to the JUMP Conference on 13 October, we decided to commission some research to get some insight into how modern marketers are embracing multichannel marketing. The research reveals that whilst the majority are using at least three marketing channels (98%), many are not maximising the potential value of this multichannel approach with over half still storing the data gathered from each channel separately.